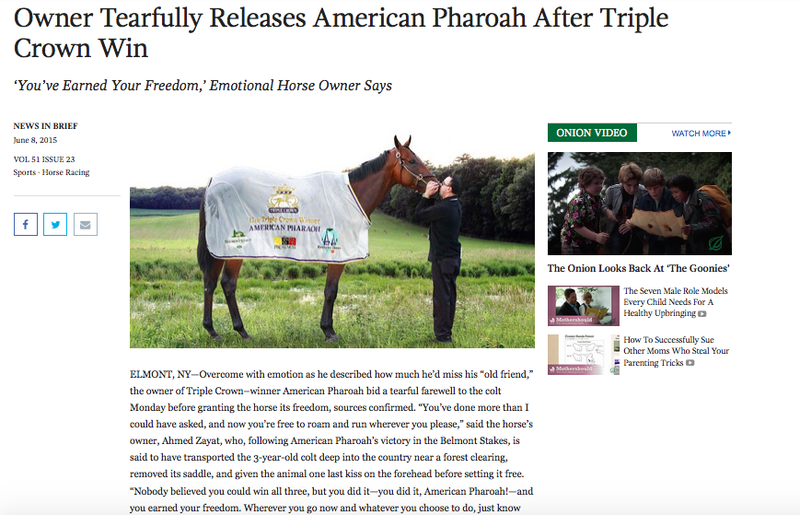 I guess that some people don’t understand parody, because a few minutes after I saw The Onion story, I found an online petition suggesting that American Pharoah be “emancipated” from owner Ahmet Zayat! That’s not an Earthquake . . . it’s galloping drafts! I saw that and was totally puzzled until I saw the Onion piece. All you can do is shake your head. Some people really are clueless. Can you see AP turned out in the wild on his own? Right, he’d last a few days at least. I suspect that the people who think he should be “set free” have no idea about how well he lives!